After two years a correction appeared. I am sure everyone would be fine with waiting another two years for the next one. Unfortunately, the odds of having another two-year unobstructed rally without a correction are very slim. Typically, we have one 10% dip per year, two 5% dips and two 3% dips. It has been 14 months since the last 3% decline so that was well overdue. Declines are good for the market. They provide opportunities to take profits and enter new positions. Unfortunately, they are never fun. We were blown out of our entire portfolio the prior week. Some positions were profitable, some were not. Life goes on. 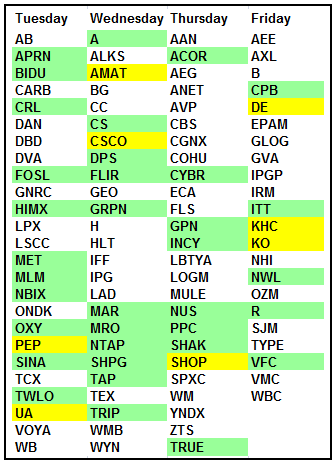 I am bring back two of those positions and assuming the market continues to improve I may add back a couple more. On Monday, the Dow posted a slow and steady gain to more than 500 points before falling back at the close to +410. Could we please have more days like this with minimal volatility? Historically, it takes 4-5 weeks to work through the post correction volatility. Given the strong earnings and the benefit of the tax reform, it may not take that long to recover. I do not expect a vertical V bottom bounce but we could have a moderately quick recovery. There will be additional volatility. The major indexes have clear resistance and there will be sellers at those resistance levels. However, remember how long investors have been waiting to buy a dip and there were none. Now that stocks are cheaper, it appears they are coming back into the market. The investors who were long and were hurt in the decline will probably be more cautious. Typically, there is a retest of the initial lows. The 410-point gain today gave us a cushion against further selling. That means a retest may not return to the lows but just be another dip on the market road higher. 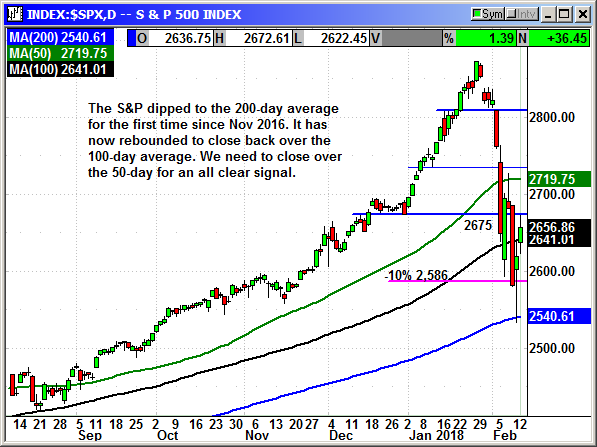 The S&P dipped to the 200-day average for the first time since November 2016. 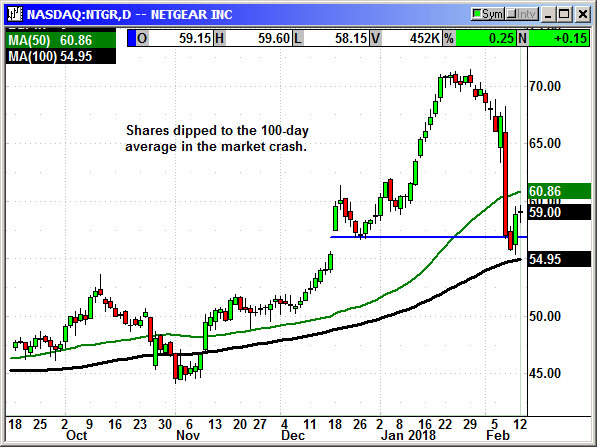 Today it rebounded to close above the 100-day. We need to see it rise and close over the 50-day for an all clear signal. That is still about 78 points above today's close. On Friday, the Dow bounced from support just above 23,250 and closed back above the 10% correction level of 23,954. The index tested that level for four consecutive days an closed under it on only one day by about 100 points. 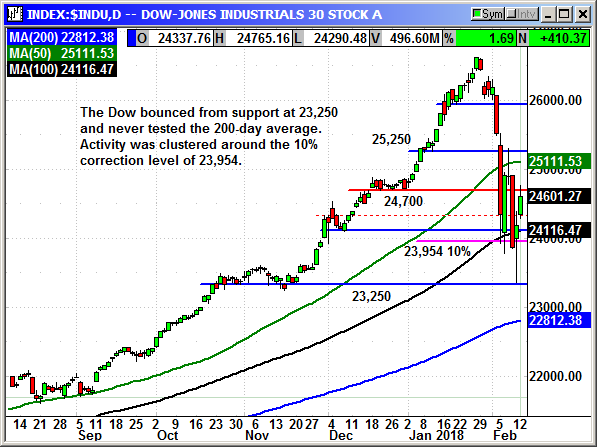 Monday's rebound retested prior support at 24,700, which should now be resistance. As with the S&P we need to see the Dow close over the 50-day at 25,111, which also gets us over the psychological level of 25,000 once again. 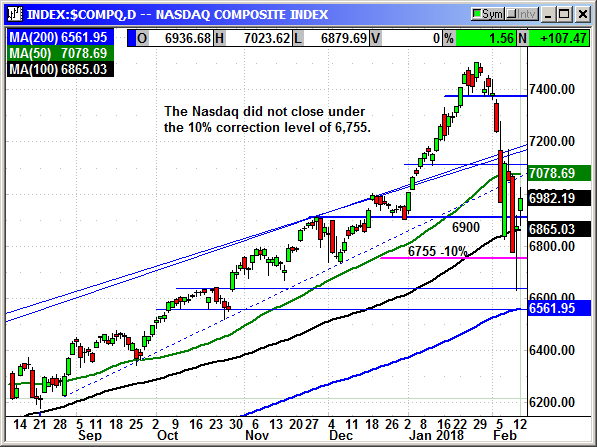 The Nasdaq had another banner day with a 107 point gain and solid rebound back above the 100-day average. The 50-day is still the level we need to see conquered before we can assume most of the selling it behind us. The index has gained 100 points for two consecutive days although the upward velocity slowed on Monday afternoon at the 7,000 level. 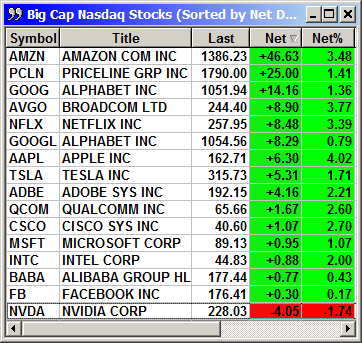 Facebook and Nvidia have been drags for the last several days but Apple is exploding higher. 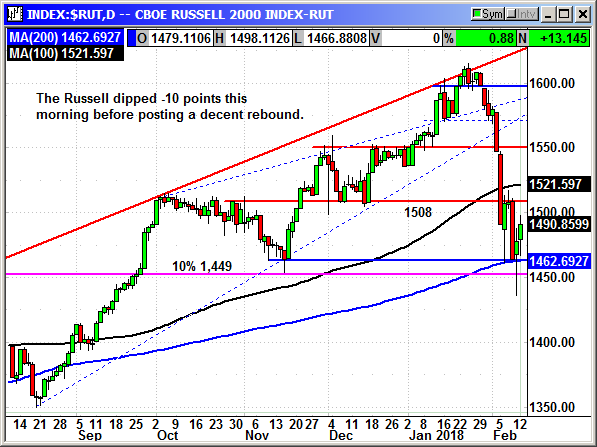 The Russell 2000 never closed in correction territory and only dipped that low on one day. The index declined -10 points this morning but recovered to post a decent gain. The 100-day level is going to be resistance on the way back up along with 1,508. 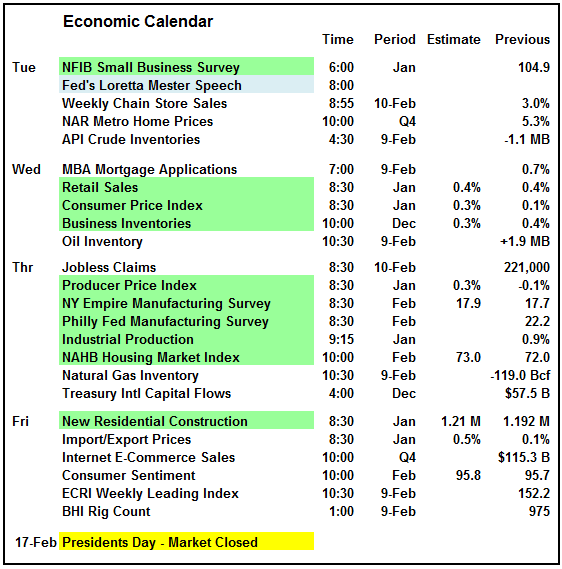 The economic calendar is busy this week but the reports will be ignored as long as the Dow is making large triple digit moves. The market is the only thing on investor's minds this week. The earnings cycle is winding down with only 57 S&P companies reporting this week. Cisco Systems is the only Dow component with Walmart and Nike the only two left to report after Cisco. Walmart is next week. The earnings headlines will be second to the market movement headlines but a couple tame days in the markets could put earnings back into focus. I would not expect uninterrupted gains in the days ahead. That would be too easy. The upward velocity did slow towards the end of the day and the S&P futures had been down -8 but have recovered to unchanged. I am sure there are investors who missed selling at higher levels and they will be thinking, "If these *&$!# shares ever get back to that level I am selling. That is what causes continued volatility as the markets begin to rebound. I would not hesitate to buy good stocks on dips because the worst volatility is probably behind us. 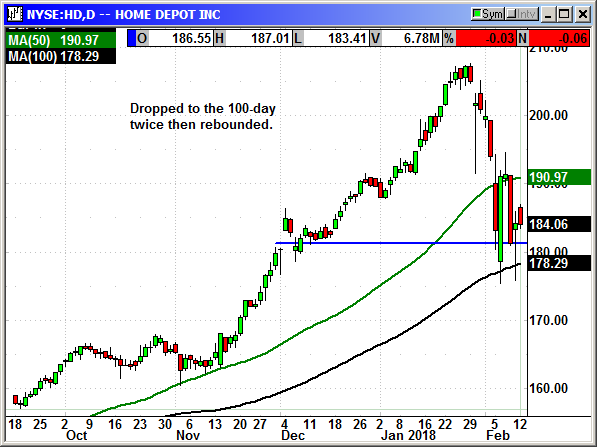 HD was hammered in the correction and we were blown out of our position with a $8 gain. I feel strongly about HD's potential and they are reporting earnings next week. The correction did not change their earnings picture. If they post a big beat, the stock could return to the pre correction levels. Buy April $190 call, currently $5.65, no initial stop loss. Shares crashed with the market to stop us out the prior week. This should be a new buying opportunity. Buy June $65 call, currently $3.40, no initial stop loss because of market volatility. The VXX futures ETF is a flawed product. The recent volatility spike WILL erode as volatility returns to normal. We cannot use options on the VXX because the premiums are ridiculous. We can short it. We have shorted it multiple times over the last three years in the Premier Investor Newsletter. Each time it eventually declines to $10 and does a reverse 1:4 split and then we launch a new position at the higher price. 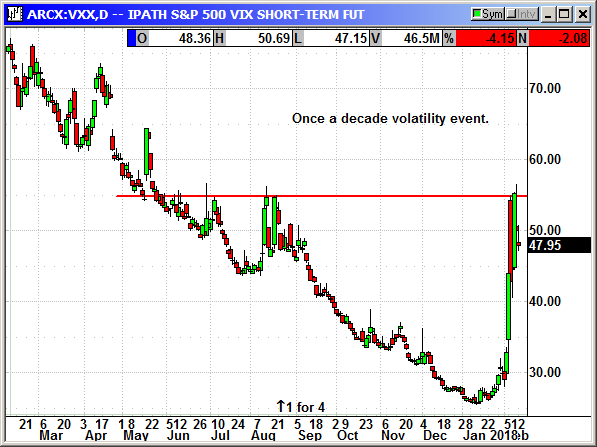 The recent volatility event in the VXX is a once in a decade event. Without a nuke going off somewhere in the US, the odds of seeing the ETF over $50 again over the next year, is very remote. Short VXX shares, currently $47.93, no initial stop loss. The long call position was entered at the open on Tuesday. Winner, winner! The new ABBV play was entered at the open on Tuesday and that was the day the market gapped down -500 points. 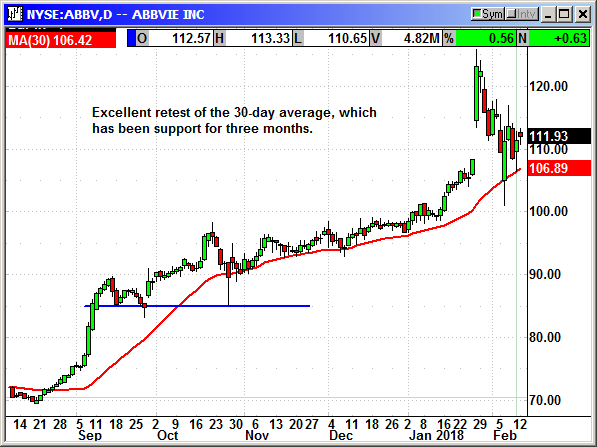 ABBV gapped down -8 points and we got an excellent fill on the position. No specific news this week.